Sugary. Fluffy. Delicious. Another post of a not-the-healthiest food but certainly healthier because these are not fried, they’re baked! It’s actually a little similar to breadsticks. Easy to make but different shapes. These are also dipped in some butter but instead of parmesan and garlic salt it’s cinnamon and sugar. 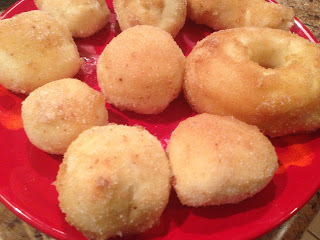 I used stuff around my cupboards to make the doughnuts since I didn’t have a cutter that worked. I seriously used a cup and a Medela baby bottle I usually pump milk into to cut the whole in the middle. ha! If it works, why not?! 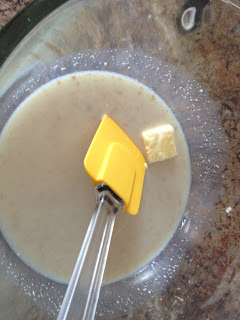 To make the dough, place ¼ cups of the warm milk in the bowl of a stand mixer. 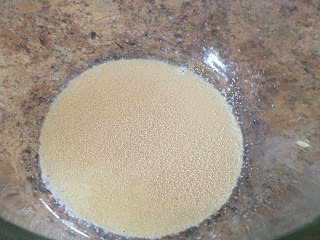 Sprinkle the yeast over the milk. Let sit for 5 minutes. In a small bowl, combine the remaining ½ cup of milk with the sugar and butter. Add it to the yeast mixture. Stir to combine. Add the egg and stir until incorporated. Add the flour, nutmeg, and salt and stir until the dough starts to form. Change to the dough hook and knead for until the dough starts to become smooth. 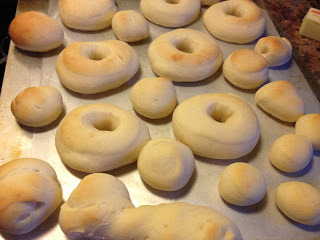 If the dough is too sticky, slowly add more flour until it is no longer sticky. Transfer to the dough to a lightly floured surface and knead for 5 minutes until the dough is smooth and elastic and has formed a ball. 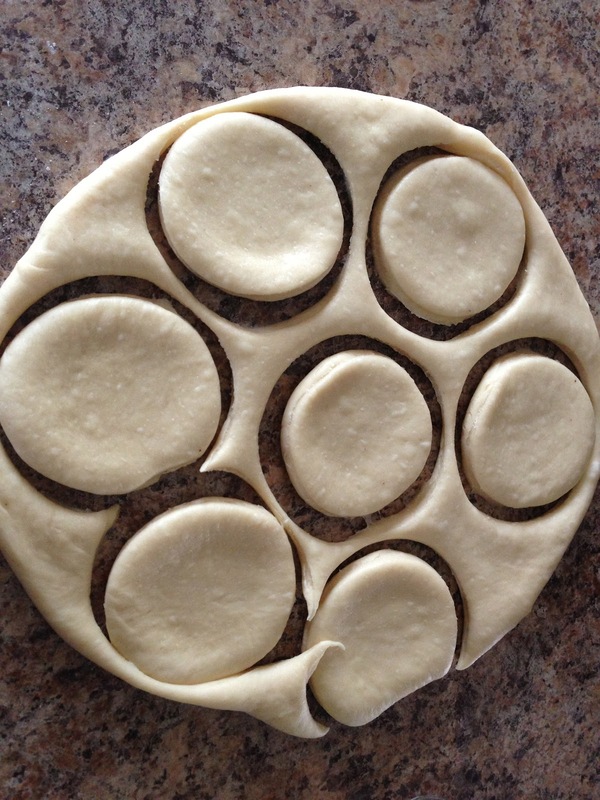 Place the dough ball in a large lightly greased bowl, and cover with plastic wrap. Let sit in a warm place for about 1 hour, until doubled in size. 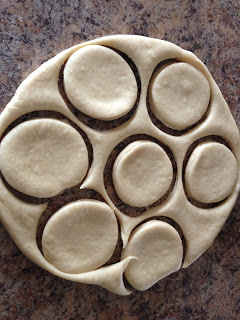 Once the dough has risen, roll it out on a lightly floured surface until ½ thick. 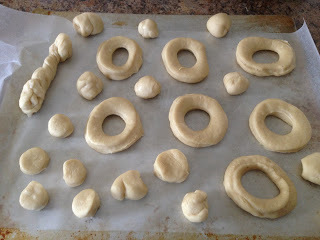 Using a doughnut cutter (if you don’t have a doughnut cutter, you can use 2 biscuit cutters – 1 that is about 3 inches, and the other that is about 2 inches for the inner circle) cut out the doughnuts until you have no dough left (I used what I found in cupboards like previously mentioned above). If desired you can gather up the scraps into a ball and roll it out and cut out more doughnuts. I prefer not too because I feel the dough becomes too tough. Place the doughnuts on a baking sheet lined with a silicone mat or parchment paper, about 2 inches apart (didn’t feel was necessary). Cover with a clean towel and let sit for about 45 minutes. 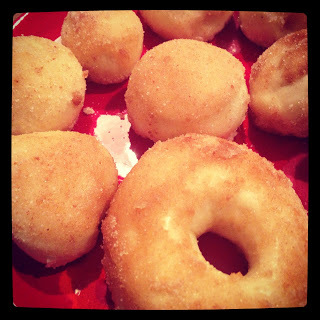 While the doughnuts are cooling make the cinnamon sugar glaze. To make the cinnamon sugar topping, melt the butter in a saucepan or a microwave, and place in a small bowl. Combine the sugar and cinnamon in a medium sized bowl. 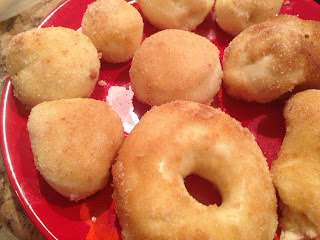 To top the doughnuts with cinnamon sugar, dip the halfway (I did mine on both sides) into the melted butter. Then dip them into the cinnamon-sugar mixture. Set on a draining/cooling rack to set, about 5 minutes. blog I got recipe from. She provides a glaze as well but I didn’t like it very much.